Mammals are any of the animals that belong to the taxonomic class Mammalia. Mammals are a large class containing many orders with many species. They are all linked by several common traits. 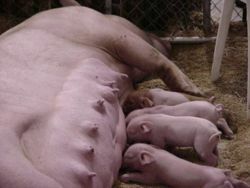 All mammals have mammary glands, which produce milk to feed their young during the early parts of their life. They also all have hair covering some part of their body during their life and four chambered hearts All give live birth, with the exception of monotremes and marsupials. Mammals are an extremely wide spread group living in environments from below the waves of the ocean, to the peaks of mountains. All species of mammals encompasses herbivores, carnivores, omnivores and are very adaptive. All mammals have several characteristic structures. All mammals have mammary glands, from which they get their name. These glands are composed of various ducts and glandular tissues that produce milk to nourish their young. All mammals have hair covering at least some part of their body during their life. Many land mammals are usually covered in hair. All mammals also have a four-chambered heart, and a rather large cerebral cortex, compared to most other animals. Many mammals also have diaphragms, which is a layer of muscle separating the thoracic and abdominal cavities at the base of the ribcage. Mammals are not the only creatures to possess diaphragms. Mammalian anatomy is quite varied between specific subclasses of mammals. The anatomy of mammals is primarily determined by their habitat, and thus their means of movement. Most mammals are terrestrial, traveling across land. Of these travelers, quadrupeds are the most common. Relying on four limbs for locomotion, quadrupeds encompass most of the subclasses, including Carnivora, Monotremata, Proboscidea, and Rodentia. Among these, there are still several types of quadrupedal movement, including a walking motion, leaping, and galloping movements. The bodily structure of many quadrupeds is very similar.They have a spinal cord and spinal column along the ventral surface of their body. Attached to this and extending down and along the sides of the body is the rib cage. The spinal column usually ends in a pelvis, to which the hind legs are attached. The frontal vertebrae of the spinal column forms the literal backbone of the quadruped's neck. On either side of the top of the rib cage, adjacent to the spinal column are shoulders, which form a girdle, to which the front legs are attached. At the very front, the skull, with a moving lower jaw bone, forms the head. Within the central body of the terrestrial mammal, are many of the vital organs linked to the digestive, circulatory, respiratory systems. The central nervous system is composed of the brain, located in the head, and the spinal cord. Various nerves branch out to the limbs, and other extremities of the body, which is used for sensory. There are marine mammals as well, namely those is Sirenia, and Cetacea. They are dolphins, porpoises, whales, dugongs, and sea cows. They achieve respiration through the use of a blow hole, a respiratory opening on the dorsal surface of their body. The animal must surface periodically to breath. Movement for these mammals is quite different from the quadrupeds, using wave-like motions of their fins and tails to propel themselves through the water. Still other mammals are airborne. The bats, belonging to Chiroptera, are mammals with wings, and large ears. While generally bats have poor eyesight, they make use of echolocation. By emitting sharp sounds, the bat can detect a moving target in front of it. Some terrestrial mammals, are not true quadrupeds either. Mammals like the kangaroo and wallaby are technically bipedal, using their powerful hind legs to travel by hopping. 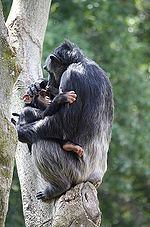 Generally, bipedal movement is not very common among mammals, even primates. All mammals, except for some primates, only reproduce during certain times and seasons. Every mammal reaches sexual maturity at a different age. Some, mostly rodents, are able to breed at only a few weeks to a few months old. Other larger mammals may take several years before their mating cycle begins. Just as well, larger mammals will usually mate more than once throughout their life. Every mammal also has a different method of attracting a mate. Despite the method however, the male's success in attracting a female relies on her period of ovulation. During ovulation, or estrus, the female is most receptive and has the highest possibility of being impregnated. Many smaller mammals are preyed upon often, and thus they have short periods between breeding and usually give birth to litters, or a large number of young. Large mammals, like the elephant and rhinoceros can take years before breeding, as they are capable of defending themselves against predators. A disadvantage to this, however, is that they are more likely to be endangered as an extended reproductive cycle is a bit of a luxury in survival. All mammals, except for Monotremes and Marsupials, are placental and give live birth. Placental mammals get their name from an organ used in females to nurture their young, the placenta. A major advantage of the placenta is the ability to directly nourish the embryo from within the mother's womb. Other non-placental animals have an embryo that is kept separate from the mother in an amniotic casing. This means that after hatching, the young will require intensive care. In placental mammals however, this is not the case. The placenta is a fairly complex organ with various tissue layers and irrigation barriers that can not only directly provide nutrition to the developing young, but also filter out wastes from the blood, as it is attached to the womb. The period the young stay within the mother is called the gestation period. The stage of advancement an animal is at after birth is directly related to the length of the gestation period. Rats, for example, have a gestation period of only 21 days, and are born naked, blind, and essentially helpless. Guinea pigs, on the other hand, have a gestation period of around 67 days and born with a thin layer of fur, and are capable of feeding themselves. Many large mammals like elephants can have a gestation period of up to a full year and can give birth to only one child at a time. More medium sized mammals, such as wolves, give birth to around 4 to 8. Some are even capable of running only a few days after birth. Monotremes, the echidna and platypus, are a bit of an oddity. Unlike all other mammals, they are oviparous, which means that they lay eggs. The eggs are incubated externally by the female, and hatch fairly shortly. In echidnas, the new hatched young are kept in an incubated pouch on the underside of the mother's body. Young platypuses, usually will not leave the mother's nest for a week before they can move on their own. The young require intense external care before and after hatching. Marsupials, such as kangaroos, give birth prematurely. The gestation period of a joey, or infant kangaroo, is only a few weeks. This is an incredibly short time for the size of the animal. They are born in essentially a fetal state, and will crawl across the mother's fur to her pouch where they are nourished. Here they will spend up to a year in the pouch, completing their development. Intelligence is defined as the ability to learn, comprehend and even pass on knowledge. Even still, the word takes a much broader, more complex definition, when referring to quantifying intelligence in animals. Mammals have long been thought to be the most intelligent of all creatures, but intelligence is hard to measure. There are many factors contributing to a mammal's thought processes as there are for all animals. One indicator of intelligence is the development of a complex system of speech that can be interpreted as a language. Language is not uncommon, but it is found to be the most refined in mammals such as prairie dogs, who rely on chirps to warn others about potential threats approaching. Studies on the language of these mammals included the recording and comparing of different chirps emitted. It was later discovered that not only were the prairie dogs able to identify a human, but what color he was wearing and how fast he was moving. Some, such as bats, are used for completely different purposes. Bats will use high pitched chirps and screeches as a means of echolocation to track down prey while in the air. It seems the development of verbal communication depends on the mammal's use of it. Another variable to determine overall intelligence is the structure of the mammal's brain itself. Mammals have a brain structure which is unique, the cerebral neocortex. This is the outer layer of six layers of cerebral hemispheres. Some of its advanced functions include not only spatial reasoning and perception, but conscious thought and language. This is also linked to self recognition, or the mammal's ability to recognize itself as an individual. A mirror test was devised to test this. The mammal was placed in front of a mirror, after being marked with odorless markers. Dolphins showed the highest level of self recognition, as they immediately began inspecting themselves in the mirror, attempting to remove the marks. The only other mammals to have shown this high of a degree of self recognition are the great apes. ↑  Milton Hilderbrand and George Goslow, Earthlife.net, accessed January 30, 2011. ↑  Gordon Ramel, Earthlife.net, accessed January 31, 2011. ↑  David M. Armstrong, J. Knox Jones, Jr. and Don E. Wilson, Encyclopedia Britannica, Accessed February 11, 2011. This page was last modified on 8 February 2017, at 17:05.